When looking for Crockpot meals that would freeze well and that my whole family would enjoy, I started looking for things with some flavor. Who needs some blah plain shredded chicken when you can have some spice! This started as a recipe for actual fajitas, but I adapted it along with some other recipes to create something that could be served over rice. When freezing meals you do not know when you will actually eat them and I didn't want to risk the tortillas going bad. This is not very spicy, so if you like spice feel free to add some chili powder to kick it up a notch. 2 lbs. Inexpensive thin cuts of steak. We used the steak already cut into strips in the meat department. 1 Packet of Fajita seasoning. If you like a peppier meal, you can add two packets. Step 1: Place the fajita seasoning into a gallon freezer bag with the jar of chunky salsa and squish around until mixed well. Step 2: Place the remaining ingredients into the freezer bag. Freeze and remove the night before serving to thaw in the fridge. Cook in Crockpot on high for 4 hours and serve over rice. I make something similar with chicken breasts. So easy and SO yummy! I love making anything in the slow cooker, this is a great recipe. WoW...you can make anything in a crock pot! You just made me hungry, lol! Sounds really yummy to me. I also love that it can be make in my crockpot. Oh yummy. This looks really good. My favorite type of meals are ones that are easy and the whole family will eat. They would Love this one. Mmm - Adding to our slow cooker list!! I had to tell you that I tried your recipe today and it was GREAT. Thank you. On these chilly evenings, this would really hit the spot. Delicious! 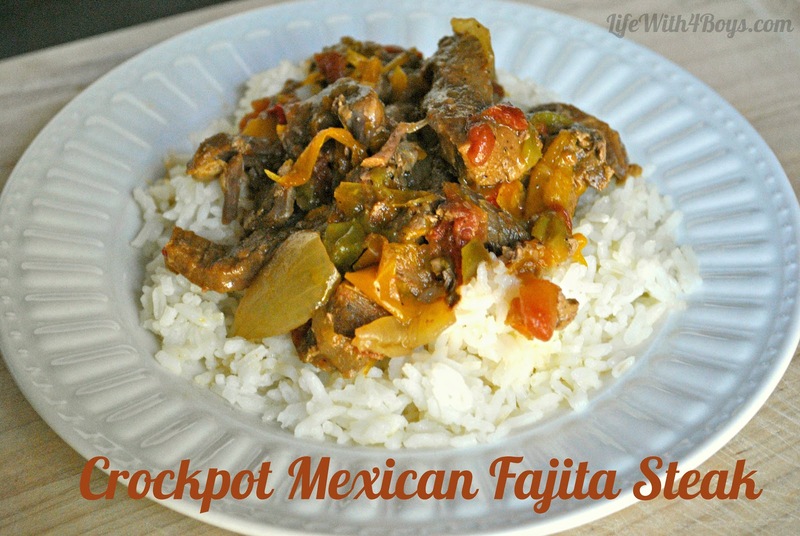 That looks super delicious and I love that the crockpot does all the work! I am totally pinning this recipe! It will be super easy to convert this to low carb! Sounds like my kind of comfort food. Looks like a wonderful alternative to standard fajitas. YUM! The only thing I would change would be......exchange the salsa for a can or 2 of ROTEL. Would do the same if using chicken. This was amazing. My boys don't even like peppers and onions, but they didn't pick them out! I served it on tortillas with a side of "Mexican Rice" (Rice mixed with salsa). It even reheated well.